You got me. The title of this post was “cleverly” made to get you to click on it. In all seriousness, though, if you are a Greek Grammar student and you use David Alan Black’s Learn to Read New Testament Greek, you will want to listen up. I’m sure you already know that there is an answer guide in the back of the book for the exercises. Have you ever hoped that there was a parsing guide for all the verbs as well? If so, you are in luck! I’ve just finished creating a parsing guide for all the exercises, including the New Testament passages in the final few chapters. And you can have it for the low low price of nada, nothing, zilch, zero … free. You can find it over at the My Tools page on the New Testament Greek Portal or here. By the way, if you haven’t been to the New Testament Greek Portal, you will definitely want to check it out. 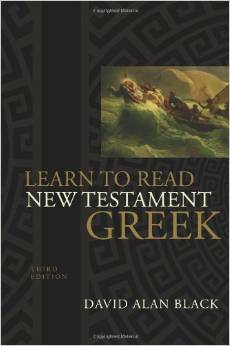 It is full of countless free resources that will aid you in your study of New Testament Greek. This entry was posted in Greek, Greek Resources. Bookmark the permalink.